The Flyers' all-time points percentage of 57.5% (as of the 2018–19 NHL season[update]) is the third-best in the NHL, behind only the Vegas Golden Knights and Montreal Canadiens. Additionally, the Flyers have the most appearances in the conference finals of all 24 expansion teams (16 appearances, winning 8), and they are second behind the St. Louis Blues for the most playoff appearances out of all expansion teams (39 out of 51 seasons). In 1946, a group led by Montreal and Philadelphia sportsman Len Peto announced plans to put another NHL team in Philadelphia, to build a $2.5 million rink to seat 20,000 where stood the old Baker Bowl and to acquire the franchise of the old Montreal Maroons. The latter was held by the Canadian Arena Company, owner of the Montreal Canadiens. However, Peto's group was unable to raise funding for the new arena project by the league-imposed deadline, and the NHL cancelled the Maroons franchise. While attending a basketball game on November 29, 1964, at the Boston Garden, Ed Snider, the then-vice-president of the Philadelphia Eagles, observed a crowd of Boston Bruins fans lining up to purchase tickets to see a last-place ice hockey team. He began making plans for a new arena upon hearing the NHL was looking to expand due to fears of a competing league taking hold on the West Coast and the desire for a new television contract in the United States. Snider made his proposal to the league, which chose the Philadelphia group—including Snider, Bill Putnam, Jerome Schiff and Philadelphia Eagles owner Jerry Wolman—over the Baltimore group. The new teams were hampered by restrictive rules that kept all major talent with the "Original Six" teams. In the NHL Expansion Draft, most of the players available were either aging veterans or career minor-leaguers before expansion occurred. Among the Flyers' 20 selections were Bernie Parent, Doug Favell, Bill Sutherland, Ed Van Impe, Joe Watson, Lou Angotti, Leon Rochefort and Gary Dornhoefer. Having purchased the minor-league Quebec Aces, the team had a distinctly francophone flavor in its early years, with Parent, Rochefort, Andre Lacroix, Serge Bernier, Jean-Guy Gendron, Simon Nolet and Rosaire Paiement among others. Beginning play in 1967–68, the Philadelphia Flyers made their debut on October 11, 1967, losing 5–1 on the road to the California Seals. They won their first game a week later, defeating the St. Louis Blues on the road, 2–1. The Flyers made their home debut in front of a crowd of 7,812, shutting-out their intrastate rivals, the Pittsburgh Penguins, 1–0 on October 19. Lou Angotti was named the first captain in Flyers history, while Rochefort was the Flyers' top goal scorer after netting a total of 21 goals. With all six expansion teams grouped into the same division, the Flyers were able to win the division with a sub-.500 record despite being forced to play their last seven home games on the road due to a storm blowing parts of the Spectrum's roof off. However, playoff success did not come so quickly, as the Flyers were upset by St. Louis in a first round, seven-game series. Angotti left the team in the off-season and was replaced by Van Impe as team captain. Led by Van Impe and the team-leading 24 goals of Andre Lacroix, the Flyers struggled during their sophomore season by finishing 15 games under .500. Despite their poor regular season showing in 1968–69, they made the playoffs. They again lost to St. Louis, this time being dispatched in a four-game sweep. Not wanting his team to be physically outmatched again, majority owner Ed Snider instructed general manager Bud Poile to acquire bigger, tougher players. While head coach Keith Allen soon after replaced Poile as general manager, this mandate eventually led to one of the most feared teams to ever take the ice in the NHL. The keystone of those teams was acquired when the Flyers took a chance on a 19-year-old diabetic from Flin Flon, Manitoba, Bobby Clarke, with their second draft pick, 17th overall, in the 1969 NHL Amateur Draft. Keeping to Snider's mandate, the team also drafted future enforcer Dave Schultz 52nd overall. Kate Smith singing "God Bless America" prior to importnant games became a Flyers tradition. By the time training camp came around, it was clear that Clarke was the team's best player, and he quickly became a fan favorite. His 15 goals and 31 assists in his rookie season earned him a trip to the NHL All-Star Game. Despite his arrival, the team struggled in 1969–70, recording only 17 wins—the fewest in franchise history (as of completion of the 2012–13 season—and set the NHL team record for most ties (24). They lost the tiebreaker for the final playoff spot to the Oakland Seals, missing the playoffs for the first time. On December 11, 1969, the Flyers introduced what became one of the team's best-known traditions: playing a recording of Kate Smith singing "God Bless America" instead of "The Star-Spangled Banner" before important games. The perception was that the team was more successful on these occasions, so the tradition grew. The move was initially done by Flyers Promotion Director Lou Scheinfeld as a way to defray national tensions at the time of the Vietnam War: Scheinfeld noticed that people regularly left their seats and walked around during the anthem, but showed more respect and often sang along to "God Bless America". To this day, the team plays the song before major playoff games, currently with Lauren Hart, daughter of Hall of Fame Flyers broadcaster Gene Hart, performing the first part of the song, a recording of Smith singing the second part, and Lauren Hart joining the recording for the finale. As of the close of the 2016–17 season, the Flyers have a record of 100–29–5 when "God Bless America" is sung prior to Flyers home games. In 1970–71, the Flyers returned to the playoffs, but were swept by the Chicago Black Hawks in the first round. Even though the team had improved their record in his second season behind the bench, head coach Vic Stasiuk was replaced by Fred Shero in the off-season. Clarke continued to progress as he led the team in scoring in 1971–72 and became the first Flyer to win an NHL award, the Bill Masterton Memorial Trophy for perseverance, sportsmanship and dedication to hockey. However, in the season's final game, the Flyers needed a win or a tie against the second-year Buffalo Sabres to beat-out Pittsburgh for the final playoff spot. The score was tied late in the game, but with just four seconds on the clock, former Flyer Gerry Meehan took a shot from just inside the blue line that eluded Flyers goaltender Doug Favell. The Flyers lost the tiebreaker to Pittsburgh and missed the playoffs. As it turned out, it was the last time the Flyers missed the playoffs for 18 years. It was during the 1972–73 season that the Flyers shed the mediocre expansion team label and became the intimidating "Broad Street Bullies", a nickname coined by Jack Chevalier and Pete Cafone of the Philadelphia Bulletin on January 3, 1973, after a 3–1 brawling victory over the Atlanta Flames that led Chevalier to write in his game account, "The image of the fightin' Flyers spreading gradually around the NHL, and people are dreaming up wild nicknames. They're the Mean Machine, the Bullies of Broad Street and Freddy's Philistines." Cafone wrote the accompanying headline: "Broad Street Bullies Muscle Atlanta." That same month, Clarke was the youngest player (at that time) in NHL history to be named team captain, replacing Ed Van Impe. Rick MacLeish became the first Flyer to score 50 goals in a season and the Flyers recorded their first winning season. An overtime goal by Gary Dornhoefer in Game 5 turned the tide of their first round series with the Minnesota North Stars in the Flyers' favor, as the Flyers got their first playoff series win in six games. However, they were outmatched in the semi-finals by the Montreal Canadiens, losing in five games. After the season, Clarke was awarded the Hart Memorial Trophy as the NHL's most valuable player. Come playoff time, the Flyers swept the Atlanta Flames in four games in the first round. In the Semi-finals, the Flyers faced the New York Rangers. The series, which saw the home team win every game, went seven games. Fortunately for the Flyers, they had home-ice advantage as they advanced to the Stanley Cup Finals by winning Game 7 and in the process made history by becoming the first expansion team to win a playoff series over an Original Six team. Their opponent, Bobby Orr and the Boston Bruins, took Game 1 in Boston, but Bobby Clarke scored an overtime goal in Game 2 to even the series. The Flyers then won Games 3 and 4 at home to take a 3–1 series lead, though Boston won Game 5 to stave off elimination. That set the stage for Game 6 at the Spectrum. The Flyers picked up the lead early when Rick MacLeish scored a first period goal. Late in the game, Orr hauled down Clarke on a breakaway, a penalty which assured the Flyers of victory. Time expired as the Flyers brought the Stanley Cup to Philadelphia for the first time. Parent, having shutout Boston in Game 6, won the Conn Smythe Trophy as the MVP of the playoffs. In 1974–75, Dave Schultz topped his mark from the previous season by setting an NHL record for penalty minutes with 472. Clarke's efforts earned him his second Hart Trophy and Parent was the lone recipient of the Vezina Trophy. The Flyers as a team improved their record slightly with a mark of 51–18–11, the best record in the NHL. After a first-round bye, the Flyers easily swept the Toronto Maple Leafs and were presented with another New York-area team in the semi-finals, the New York Islanders. The Flyers looked to be headed toward another sweep after winning the first three games. However, the Islanders fought back by winning the next three games, setting up a deciding seventh game. The Flyers were finally able to shut the door on the Islanders, winning Game 7, 4–1. Facing Buffalo in the Stanley Cup Finals, the Flyers won the first two games at home. Game 3, played in Buffalo, went down in hockey lore as "The Fog Game" due to an unusual May heat wave in Buffalo that forced parts of the game to be played in heavy fog, as Buffalo's arena lacked air conditioning. The Flyers lost Games 3 and 4, but won Game 5 at home in dominating fashion, 5–1. On the road for Game 6, Bob Kelly scored the decisive goal and Parent pitched another shutout (a playoff record fifth shutout) as the Flyers repeated as Stanley Cup champions. Parent also repeated as the playoff MVP, winning a second consecutive Conn Smythe Trophy. The Flyers recorded the best record in team history (points-wise) with a record of 51–13–16. The LCB line, featuring Reggie Leach at right-wing, Bobby Clarke at center and Bill Barber at left-wing, set an NHL record for goals by a single line with 141 (Leach 61, Clarke 30, Barber 50). Clarke, on his way to a third Hart Trophy, set a club record for points in one season with 119. Heading into the playoffs, the Flyers squeaked past Toronto in seven games and defeated Boston in five games, with Game 5 featuring a five-goal outburst by Leach, the "Riverton Rifle", to head to a third-straight appearance in the Stanley Cup Finals. However, the Flyers did not come close to a third straight championship without an injured Bernie Parent, as they ran into an up-and-coming dynasty in Montreal, and were swept in four-straight games. Despite the loss, Leach was awarded the Conn Smythe Trophy for scoring a record 19 goals in 16 playoff games. Dethroned, the heyday of the Broad Street Bullies began to come to an end, as prior to the 1976–77 season, tough-guy Dave Schultz was traded to the Los Angeles Kings. Despite a slight drop-off in performance, the Flyers dominated the Patrick Division with what proved to be their fourth-straight division title. After disposing of Toronto in six games, the Flyers found themselves in the Semi-finals for the fifth consecutive season. Pitted against Boston, the Flyers lost Games 1 and 2 at home in overtime and did not return home as they were swept in four-straight games. The Flyers lost their hold on the Patrick Division in 1977–78 and settled for second place. After sweeping the Colorado Rockies in two games in the preliminary round, the Flyers moved on to beat Buffalo in five games. They then faced Boston in the semi-finals for the second consecutive season, and lost again, this time in five games. Following the season, the Flyers were stunned when Head Coach Shero left to become general manager and head coach of the New York Rangers. As compensation for Shero, the Flyers received the Rangers' first-round draft pick in 1978. Bob McCammon, who had just coached the Flyers' first year American Hockey League (AHL) Maine Mariners farm club to a Calder Cup title, replaced Fred Shero behind the bench. After a slow start in 1978–79, the Flyers switched McCammon with Pat Quinn, Shero's previous assistant coach, who had replaced McCammon with the Mariners. Adding to the problems, Bernie Parent suffered a career-ending eye injury. The Flyers rallied under Quinn and finished in second place. Matched-up against the Vancouver Canucks in the preliminary round, the Flyers won the series in three games. The Flyers' season came to an end against Fred Shero's Rangers in a five-game quarterfinal loss. The Flyers began the 1979–80 season with a somewhat controversial move by naming Clarke a playing assistant coach and giving the captaincy to Mel Bridgman. While Clarke was against this initially, he accepted his new role. The Flyers went undefeated for a North American professional sports record 35-straight games (25–0–10), before losing 7–1 to the Minnesota North Stars, a record that still stands to this day. The streak started after the team was 1–1 on October 14, and ended on January 7, 1980. In doing so, the Flyers wrapped up the Patrick Division title with 14 games to spare and the first overall seed in the playoffs. Their regular-season success continued into the playoffs, as the Flyers swept a young Wayne Gretzky and his Edmonton Oilers in the first round, then went on to get revenge against Fred "The Fog" Shero and his Rangers by beating them in five before disposing of Minnesota in five to lock up a berth in the Stanley Cup Finals. Facing the Islanders for the Cup, the Flyers ultimately lost in six games on Bob Nystrom's overtime Stanley Cup-winning goal. The end result of the series was marred by controversy, as the Islanders were offside on the play that resulted in their second goal, but the call was not made. Linesman Leon Stickle admitted after the game that he had blown the call. The Flyers made early playoff exits the next four years, including three first round exits in a row. After a tough, five-game preliminary round series win against the Quebec Nordiques, the team's 1980–81 season came to an end as they lost in the quarterfinals to the Calgary Flames in seven games. They then lost to the Rangers two years in a row in 1981–82 and 1982–83 and then were swept by the Washington Capitals in 1983–84. It was after the latter of these playoff losses that Bobby Clarke retired and was named vice-president and general manager of the team. Mike Keenan, a relative unknown at the time, was hired in 1984 to coach the team, and named second-year player Dave Poulin team captain. Behind the goaltending of Pelle Lindbergh (who led the NHL with 40 wins and was the first European to win the Vezina Trophy), the Flyers won a franchise-record 53 games—best in the NHL—during the 1984–85 season. The Flyers rolled through the playoffs by sweeping the Rangers in three games, defeating the Islanders in five and beating Quebec in six to return to the Stanley Cup Finals. Though they defeated the defending Stanley Cup champion Oilers in Game 1 by a score of 4–1 at home, Edmonton won the next four games and the series. A month into the 1985–86 season, Pelle Lindbergh was killed in a car accident. The team rallied and showed perseverance by garnering the best record in the Wales Conference and matching their win total (53) from the previous year. Tim Kerr scored 58 goals and the defense pairing of Howe and Brad McCrimmon led the League in plus-minus, a +85 and a +83, respectively. Bob Froese filled in admirably in net for Lindbergh, being named a second Team All-Star and sharing the William M. Jennings Trophy with teammate Darren Jensen. Despite their regular season success, an emotionally-exhausted Flyers team lost in the first round of the playoffs to the Rangers in five games. Prior to the 1991–92 season, the Flyers acquired Rod Brind'Amour from St. Louis. Brind'Amour led the Flyers in goals (33), assists (44) and points (77) in his first season with the club. With Ron Sutter gone to St. Louis in the Brind'Amour trade, Rick Tocchet was named team captain. As the Flyers continued to flounder, Paul Holmgren was fired midway through the season and replaced by Bill Dineen, father of Flyer Kevin Dineen. On February 19, the Flyers and Pittsburgh made a major five-player deal which featured Tocchet—who never grew comfortably into the role of captain—heading to Pittsburgh and Mark Recchi coming to Philadelphia. Recchi recorded 27 points in his first 22 games as a Flyer, but the team missed the playoffs for the third consecutive year, due in large part to an awful road record (10–26–4). With Tocchet traded, the Flyers remained without a captain until Kevin Dineen was named to the post in 1993–94, and instead went with three alternate captains. In June 1992, the Flyers persuaded Clarke to return to the team as senior vice president after Jay Snider won the hard-fought arbitration battle for 1991 first overall pick Eric Lindros against the Rangers. It was determined that Quebec had made a deal with the Flyers before making a deal with the Rangers. In order to acquire Lindros' rights, the Flyers parted with six players, trading Steve Duchesne, Peter Forsberg, Ron Hextall, Kerry Huffman, Mike Ricci, Chris Simon, a 1993 first-round draft pick (Jocelyn Thibault), a 1994 first-round draft pick (Nolan Baumgartner) and $15 million to Quebec. While Lindros became a preeminent star in Philadelphia, the trade proved heavily lopsided in favor of the Nordiques—soon to become the Colorado Avalanche—providing the core of their two Stanley Cup teams and an unprecedented eight-straight division championships, with Forsberg becoming a franchise player. For 1993–94, Terry Simpson was hired as the new head coach in hopes of returning the Flyers to the playoffs after four consecutive off-years. Recchi recorded 107 points (40 goals and 67 assists) and Lindros 97 (44 goals and 53 assists), while Mikael Renberg set a Flyers rookie record with 82 points. Offense was generated yet the Flyers still failed to clinch a playoff berth, again falling four points short of the final playoff spot. Jay Snider stepped down as president, forcing his father Ed Snider to take over day-to-day operations. The elder Snider had decided he had seen enough of Farwell as general manager, and began courting Bobby Clarke to leave his general manager post with Florida to return to Philadelphia. Farwell's last move as general manager was firing Simpson after a lackluster performance. Bobby Clarke returned to the general manager position prior to the lockout-shortened 1994–95 season and immediately began putting his stamp on the team. New head coach Terry Murray replaced Kevin Dineen as team captain with Lindros prior to the start of training camp. In order to shore up the defense, Ron Hextall was re-acquired from the Islanders and high-scoring winger Recchi was traded to Montreal for Eric Desjardins, Gilbert Dionne and John LeClair early in the abbreviated season. The Flyers initially struggled out of the gate, going only 3–7–1 through their first 11 games while being outscored 34–22. Lindros and LeClair then teamed with Renberg to form the Legion of Doom line, a mix of scoring talent and physical intimidation. In their 37 games (including the 3–1 victory on February 11, 1995, against the New Jersey Devils), the Flyers went 25–9–3 and outscored their opponents 128–98 en route. Lindros tied Jaromir Jagr for the regular season scoring lead (though Jagr won the Art Ross Trophy with more goals), and captured the Hart Memorial Trophy as the league's MVP. The playoff drought came to an end as the Flyers won their first division title in eight years and clinched the second seed in the Eastern Conference. After dispatching Buffalo in five and sweeping the defending Stanley Cup champion Rangers, the Flyers were upset in the Eastern Conference Finals to the eventual Stanley Cup champion New Jersey Devils in six games. Lindros eclipsed the 100-point mark for the first time in 1995–96, gathering 115 points, and LeClair scored 51 goals, as the Flyers repeated as Atlantic Division champs and clinched the top seed in the East. Facing the eighth-seeded Tampa Bay Lightning, the Flyers dropped two of the first three games. They rallied by winning three straight games to win the series. After taking two of the first three games against their second-round opponent, Florida, the Flyers were defeated in overtime in Game 4 and double-overtime in Game 5. An upstart Florida club with stellar goaltending from John Vanbiesbrouck ended the Flyers' season in Game 6. The Flyers said goodbye to the Spectrum and prepared to open a new arena—the CoreStates Center—for the next season. In the off-season, the Flyers went looking for a new goaltender. Burke was let go and Hextall was about to enter his final season as a backup. They chose to sign former Panther John Vanbiesbrouck as the starting goaltender. The 1998–99 season was marred by a life-threatening injury sustained by Eric Lindros on April Fools' Day during a game against the Nashville Predators, a season-ending injury later diagnosed as a collapsed lung. Up until that point, Lindros was having an MVP-type season with 40 goals and 53 assists in 71 games. Without Lindros, the Flyers had trouble scoring in the playoffs even after having re-acquired Mark Recchi at the trade deadline. Although Vanbiesbrouck allowed 9 goals to Joseph's 11 allowed, the Flyers lost their first round series with Toronto in six games. The 1999–2000 season was one of the most tumultuous seasons in franchise history and the tumult actually started three months prior to the start of the regular season. In the span of a few days in July, longtime broadcaster Gene Hart died due to illness and defenseman Dmitri Tertyshny, coming off his rookie season, was fatally injured in a freak boating accident. Head coach Roger Neilson was diagnosed with bone cancer, forcing him to step aside in February 2000 to undergo treatment, so assistant coach Craig Ramsay took over as interim coach for the rest of the season; Neilson later recovered but was informed that he would not return. In January, longtime Flyer and fan favorite Rod Brind'Amour was traded to the Carolina Hurricanes in exchange for Keith Primeau, with the intention of acquiring a big center to complement Lindros. Meanwhile, the strife between Flyers management (particularly Clarke) and Lindros, continued to worsen. Less than a month after Ramsay took over, Lindros suffered his second concussion of the season. He played several games after the initial hit and afterwards criticized the team's training staff for failing to initially diagnose the concussion after it happened. It was after this that the Flyers' organization decided to strip Lindros of the captaincy on March 27 and name defenseman Eric Desjardins the team's captain. With Lindros out indefinitely, the Flyers rallied to overcome the distractions and a 15-point deficit in the standings to win the Atlantic Division and the top seed in the East on the last day of the regular season. They easily defeated their first round opponent, Buffalo, in five games. Primeau's goal in the fifth overtime of Game 4 against the team's second-round opponent, Pittsburgh, turned that series in the Flyers' favor as they won in six games, coming back from a 2–0 series deficit. After dropping Game 1 to New Jersey in the Eastern Conference Finals, the Flyers peeled off three-straight wins to take a 3–1 series lead. But New Jersey refused to give up. After New Jersey won Game 5, Lindros returned to the lineup for the first time since March for Game 6 in another losing effort. Early in Game 7, Lindros was on the receiving end of a controversial hit by Scott Stevens, giving him another concussion and leaving the Philadelphia crowd deflated. Without Lindros, the Flyers lost the decisive game by a score of 2–1. It was the second time in franchise history the team lost a series after being up three games to one. In the off-season, the Flyers re-vamped their lineup by signing Jeremy Roenick and finally trading Lindros to the Rangers for Kim Johnsson, Jan Hlavac, Pavel Brendl and a 2003 third-round draft pick (Stefan Ruzicka). Desjardins stepped down as team captain eight games into the season and was replaced by Primeau. The Flyers began 2001–02 with high expectations and with Roenick leading the team in scoring, the Flyers finished with an Atlantic Division title. The power play was one of the NHL's worst however, so Adam Oates, the third leading point-producer in the League at the time, was acquired from Washington at the NHL trade deadline. However, it was of no benefit as the Flyers could not muster much offense, scoring only two goals in their five-game, first-round playoff loss to the Ottawa Senators. It turned out there was much discontent in the locker room as Bill Barber was fired. The Flyers hired a proven winner when they turned to former Dallas Stars and Stanley Cup-winning head coach Ken Hitchcock. The Flyers began the 2005–06 NHL season with lofty expectations. Despite being hampered by injuries prior to and during the season, the Flyers lived up to those expectations in the first half of the season, reaching the top of the league standings in January while simultaneously holding a ten-point lead in the Atlantic Division. The Deuces Wild line of Forsberg, Gagne and Mike Knuble recorded 75, 79 and 65 points respectively while Gagne, with Forsberg feeding him, scored a career high of 47 goals. However, the injuries began to accumulate and take their toll, the most crippling of which was Keith Primeau's season-ending concussion. Derian Hatcher served as interim captain for the remainder of the season. The Flyers had been first in the league prior to the Olympic break, where an injury to Forsberg occurred. All told, the Flyers were third in the NHL with 388 man-games lost to injury, tops amongst playoff teams. The second half of the regular season was defined by a record hovering around .500, sending the Flyers on a steady slide in the standings. The Flyers fell short of an Atlantic Division title, finishing second by tie-breaker to New Jersey, drawing the fifth seed in the Eastern Conference and a first round match-up with fourth-seeded Buffalo. The Flyers lost the series in six games. The changes did little to improve the Flyers fortunes in 2006–07 as setting franchise records for futility became the norm. They had several multiple-game losing streaks, including a franchise worst 10-game losing streak and a 13-game home losing streak that stretched from November 29 to February 10. 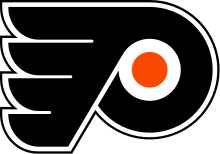 Ultimately, the Flyers finished with a 22–48–12 record, the most losses and the worst winning percentage in franchise history, and the worst record in the league. They also set the NHL record for the biggest points drop off in the standings in a one-year span (101 points in 2005–06 to 56 points in 2006–07, a difference of 45 points). The Flyers lost the NHL draft lottery to the Chicago Blackhawks and were demoted to the second overall selection. With the team clearly on the verge of missing the playoffs for the first time in 13 years, Paul Holmgren set his sights on rebuilding the team and preparing for the future. Forsberg, unwilling to commit to playing next season, was traded to Nashville for Scottie Upshall, Ryan Parent and 2007 first- and third-round draft picks at the deadline. Veteran defenseman Alexei Zhitnik was traded to the Atlanta Thrashers for prospect defenseman Braydon Coburn, while disappointing off-season acquisition Kyle Calder was sent to Detroit via Chicago in exchange for defenseman Lasse Kukkonen. The Flyers also acquired goaltender Martin Biron from Buffalo for a 2007 second-round pick. Given wide praise for his efforts, the Flyers gave Holmgren a two-year contract and removed the interim label from his title. The Flyers began the 2007–08 season with the intention of putting the disaster of the previous season behind them. In June, the Flyers made a trade that sent the first-round draft pick they had acquired in the Forsberg trade (23rd overall) back to Nashville in exchange for the rights to negotiate with impending unrestricted free agents Kimmo Timonen and Scott Hartnell. Both were subsequently signed to six-year contracts. After much speculation about whether the Flyers would keep or trade the second overall pick in the 2007 NHL Entry Draft, the Flyers opted to keep it, using it to select New Jersey native James van Riemsdyk. The Flyers wasted no time in addressing their free agent needs. On July 1, the Flyers signed Buffalo co-captain Daniel Briere to an eight-year, $52 million contract. Continuing to revamp their defensive core, Joni Pitkanen and Geoff Sanderson were traded to Edmonton in exchange for Oilers captain Jason Smith and Joffrey Lupul. Smith was later named Flyers captain on October 1. Despite holding on to the fourth seed in the East for much of the season, thanks to a 4–5–1 finish to the season, highlighted by a home loss to the Rangers on the last day of the regular season, the Flyers slipped to the fifth seed and lost home-ice advantage in their first-round series with Pittsburgh. Pittsburgh dominated the Flyers in Game 1, and despite a better effort by the Flyers in Game 2, Pittsburgh came to Philadelphia with a 2–0 series lead. The Flyers were the better team in Games 3 and 4, but Pittsburgh gained a split in Philadelphia and took a 3–1 series lead. After a decisive 3–0 win in Game 5, the Flyers jumped out to a 3–0 lead in Game 6, but promptly fell victim to the inconsistencies that plagued the team all season and gave up five unanswered goals in a season-ending 5–3 loss. Giroux led the team in scoring in the playoffs. Jeff Carter ended the regular season with 46 goals, second in the NHL after Washington's Alexander Ovechkin. Mike Richards just missed out on the Frank J. Selke Trophy in the closest vote in the history of the award. The Flyers began the 2009–10 season with some major changes, allowing goaltenders Martin Biron and Antero Niittymaki to depart via free agency, replacing them with former Ottawa netminder Ray Emery and former Flyer Brian Boucher, and significantly upgrading the defense with the addition of Chris Pronger from Anaheim. Pronger came at a price, however, costing the Flyers Joffrey Lupul, Luca Sbisa and the Flyers' first-round draft picks in both 2009 and 2010. The season began in earnest, though it soon unraveled with mediocre play that cost head coach John Stevens his job in December. Peter Laviolette was hired as his replacement in order to re institute accountability and restore success to the Flyers, though the results were not immediate; the Flyers suffered a 2–7–1 stretch immediately following his arrival. Injuries took a major toll on the Flyers, with Blair Betts, Daniel Briere, Jeff Carter, Simon Gagne and Kimmo Timonen all missing significant numbers of games, though no position was nearly affected as much with injuries as goaltending. Emery suffered a hip injury in December, played sporadically afterwards and ultimately underwent season-ending surgery. Boucher suffered a hand injury shortly thereafter, which allowed journeyman goaltender Michael Leighton to step in and make an immediate impact. Leighton went 8–0–1 in his first ten starts, including a tough 2–1 overtime loss in the 2010 Winter Classic to Boston at Fenway Park on New Year's Day. However, Leighton was forced out of the line-up in March with a high ankle sprain, necessitating Boucher's return as starter. All told, seven different goaltenders suited up for the Flyers at various points throughout the year. Mediocre play down the stretch forced the Flyers into a do-or-die shootout with the Rangers in the final game of the regular season. Boucher stopped final shooter Olli Jokinen to clinch the seventh seed in the East and a first round matchup with New Jersey. Boucher and the Flyers consistently outplayed Martin Brodeur and New Jersey and pulled off the upset in five games. However, the victory was costly, as Carter suffered a broken foot and Gagne a broken toe in Game 4, while Ian Laperriere suffered a grievous facial injury by blocking a shot in Game 5. The Flyers then faced sixth-seeded Boston in the second round, and despite playing at an even level with the Bruins, the Flyers found themselves in a 3–0 series deficit. Gagne returned in Game 4 and scored in overtime to force a Game 5, which the Flyers won convincingly, 4–0. Boucher suffered MCL sprains during the game in both knees which forced Leighton back into net in his first time suiting up since March. Boucher and Leighton became the first goalies since 1955 to share a playoff shutout. A 2–1 Flyers win in Game 6 forced a Game 7 in Boston. Falling behind 3–0 in Game 7, the Flyers pulled off the biggest comeback in both franchise and League history, winning 4–3 on a late goal by Gagne to join the Maple Leafs in 1942, the Islanders in 1975 and the Boston Red Sox in 2004 as the only sports teams to win a playoff series after trailing 3–0. The Flyers drew Pittsburgh in the first round of the 2012 playoffs, a series in which the two teams combined for an NHL-record 45 goals in the first four games and a total of 309 penalty minutes in an intense, fight-filled series. The Flyers pulled off the upset in six games against a heavily-favored Pittsburgh team. In the second round against New Jersey, the Flyers were heavily favored to win the series, but the Flyers' run-and-gun style of play was stymied by the Devils' forechecking and defense, and, although they won the first game at home in overtime, the Flyers lost four games in a row and were eliminated in five. Briere and Giroux ended the playoffs tied with five other players for the League lead in playoff goals with eight, despite their team being eliminated in the second round. The team began the lockout-shortened 2012–13 season by naming Claude Giroux captain on January 15, 2013, and starting off at 0–3–0, their worst start in 17 years. The franchise finished at a record of 23–22–3, fourth in the Atlantic and tenth in the East. The team failed to qualify for the playoffs for the first time since the 2006–07 season and only the ninth time in team history. During the offseason, the Flyers used their two contract buyouts alloted by the new CBA on Bryzgalov and Briere, and signed free agents Mark Streit (four years, $21 million) and Vincent Lecavalier (five years, $22.5 million). On October 7, head coach Peter Laviolette and assistant coach Kevin McCarthy were both fired just three games into the 2013–14 season after the team again began the season 0–3–0. Assistant coach Craig Berube, who previously played for the Flyers and served two stints as head coach of the Flyers' AHL affiliate, the Philadelphia Phantoms, was named the new head coach, while John Paddock and former Flyer Ian Laperriere were announced as Berube's assistants. The team went 42–27–10 with Berube behind the bench, clinching a playoff berth and ultimately falling in seven games to the New York Rangers in the Eastern Conference First Round. Ron Hextall served as general manager from 2014 2018. The Flyers began the 2015–16 season with a record of 4–2–1 in their first seven games. They found themselves outside of the playoff picture near the halfway point of the regular season, but a second-half surge, including a combined record of 17–7–5 in February and March, placed them into playoff position. On the second-to-last day of the season, the Flyers clinched the final wild card playoff berth with a win over Pittsburgh and an Ottawa win over Boston, which consequently eliminated the Bruins from playoff contention. The Flyers faced Washington in the first round, losing the first three games of the series. The Flyers would rally to win the next two games, but lost the series in six games. Ed Snider, Flyers chairman and co-founder passed away in 2016. On April 11, 2016, Flyers' long time chairman, co-founder, and former majority owner Ed Snider died after a two-year battle with bladder cancer. In the 2016–17 season, the Flyers won ten straight games during the months of November and December. However, they fell out of the playoff picture after that streak ended, struggling in the standings and letting other teams get ahead of them. They were eliminated from playoff contention during the last two weeks of the regular season, becoming the first team to miss the playoffs after having a winning streak of ten or more games in the process. Despite finishing sixth in their division, they won the second overall pick in the 2017 NHL Entry Draft lottery with just a 2.4% chance to win that particular pick. They used this pick to select Nolan Patrick from the Brandon Wheat Kings. In the 2017–18 season, the Flyers rallied from a 10-game losing streak early in the season to finish in third place in the Metropolitan Division, but lost to Pittsburgh in six games in the first round of the 2018 playoffs. Giroux became the first Flyer to have a 100-point season since Eric Lindros in 1995–96, finishing second in league scoring and fourth in MVP voting, while Couturier was a finalist for the Selke Trophy, and Simmonds was a finalist for the Mark Messier Leadership Award. After failing to meet expectations to start the 2018–19 season, Ron Hextall was fired as general manager. Two weeks later, Dave Hakstol was fired as head coach after the Flyers' 12–15–4 start to the season. Due to racial controversy involving vocalist Kate Smith, at the end of the 2018-2019 season, the Flyers will remove her statue from outside the stadium and will stop playing her version of God Bless America, a tradition at flyers games. On April 4, 1966, Bill Putnam—a member of the Philadelphia group that was selected by the NHL for one of the six new franchises—announced a name-the-team contest and orange, black and white as the team colors. Wanting what he referred to as "hot" colors, Putnam's choice was influenced by the orange and white of his alma mater – the University of Texas at Austin – and the orange and black of Philadelphia's previous NHL team, the Quakers. Also announced on April 4 was the hiring of a Chicago firm to design the team's arena. During the 2019 NHL Stadium Series, the Flyers wore orange and black uniforms minus the white elements. The black helmets also featured an enlarged Flyers logo on both sides. The Flyers have retired six of their jersey numbers and taken another number out of circulation. Barry Ashbee's number 4 was retired a few months after his death from leukemia. Bernie Parent's number 1 – Parent wore number 30 during his first stint with the Flyers – and Bobby Clarke's number 16 were retired less than a year after retiring while Bill Barber's number 7 and Mark Howe's number 2 were retired shortly after their inductions into the Hockey Hall of Fame. The number 31, last worn by goaltender Pelle Lindbergh, was removed from circulation after Lindbergh's death on November 11, 1985, but it is not officially retired. The NHL retired Wayne Gretzky's No. 99 for all its member teams at the 2000 NHL All-Star Game. In 2018, the Flyers retired Eric Lindros' number 88. Statistics and records are current after the 2018–19 season, except where noted. Records as of the 2018–19 season. Recording 697 regular season points as a Flyer, Rick MacLeish is the Flyers' fifth all-time points leader. "Philadelphia Flyers hockey team statistics and history". The Internet Hockey Database. Retrieved January 1, 2015. ^ Meltzer, Bill (September 1, 2016). "Meltzer: Uniformity". PhiladelphiaFlyers.com. NHL Enterprises, L.P. Retrieved September 2, 2016. ^ Meltzer, Bill (August 3, 2016). "On This Day: Franchise Adopts Flyers as Team Name". PhiladelphiaFlyers.com. NHL Enterprises, L.P. Retrieved September 2, 2016. ^ "Teams". NHL.com. NHL Enterprises, L.P. Retrieved January 11, 2017. ^ a b "NHL Teams & Other Hockey Teams". Hockey-Reference. Sports Reference LLC. Retrieved April 7, 2019. ^ Sorensen, John. "Capitals vs. Flyers: The Philthy Rivalry". NoVa Caps. Retrieved March 7, 2017. ^ Carchidi, Sam. "Flyers, Capitals renew growing rivalry". Philadelphia Media Network. Retrieved March 7, 2017. ^ a b "Ed Snider's Flyers Hall of Fame Profile". P. Anson. Flyers History. Retrieved November 10, 2013. ^ a b c For details, see #Colors, name and logo. ^ "Flyers First Ever Game". P. Anson. Flyers History. Retrieved November 10, 2013. ^ "Flyers First Ever Win". P. Anson. Flyers History. Retrieved November 10, 2013. ^ "Flyers First Home Game". P. Anson. Flyers History. Retrieved November 10, 2013. ^ "This Date in Flyers History...March 1". PhiladelphiaFlyers.com. March 1, 2005. Retrieved December 20, 2012. ^ FlyersHistory.com webpage with complete Kate Smith record. Retrieved December 21, 2016. ^ FlyersHistory.net, Philadelphia-Buffalo boxscore from April 2, 1972. ^ Jackson, Jim. Walking Together Forever: The Broad Street Bullies, Then and Now. Sports Publishing L.L.C. pp. 1–3. ^ Jack Chevalier (1973-01-03). "Broad Street Bullies Muscle Atlanta". Philadelphia Bulletin. ^ a b c Farber, Michael (February 14, 2011). "What About Bob? : The Flyers are stacked for a run at the Cup. The only question mark is in goal—where else? But unflappable Russian rookie Sergei Bobrovsky looks up to the task". Sports Illustrated. Retrieved 2011-02-11. In the beginning there was Bernie. ^ FlyersHistory.net, Flyers vs. Red Army. ^ Blumenstock, Kathy (June 2, 1980). "Putting the Hammer to the Old Bugaboo". Sports Illustrated. Retrieved November 8, 2014. ^ As of February 2011, Hextall is one of only four rookies and five players to win the Conn Smythe Trophy as a member of the losing team. The other four players are Roger Crozier (1966), Glenn Hall (1968), Reggie Leach (1976) and Jean-Sebastien Giguere (2003). Farber, Michael (February 14, 2011). "What About Bob? : The Flyers are stacked for a run at the Cup. The only question mark is in goal—where else? But unflappable Russian rookie Sergei Bobrovsky looks up to the task". Sports Illustrated. Retrieved November 9, 2014. ^ "Galleries". CNN. January 13, 1997. ^ Panaccio, Tim (July 25, 1999). "Tertyshny Is Killed in Boating Accident". The Philadelphia Inquirer. Retrieved November 8, 2014. ^ "Why is no one talking about the Flyers?". The Sports Network. The Canadian Press. September 21, 2006. Archived from the original on September 29, 2007. Retrieved November 10, 2013. ^ "New York Rangers vs. Philadelphia Flyers – Preview – January 24, 2013". ESPN. January 24, 2013. Retrieved March 3, 2013. ^ "Flyers fire Laviolette, replace with Berube". National Hockey League. October 7, 2013. ^ "The Ron Hextall Era begins". ^ "Craig Berube relieved of duties as Flyers head coach". Philadelphia Flyers. April 17, 2015. Retrieved April 26, 2015. ^ "NHL Standings - 2014-15". ESPN. Retrieved June 17, 2015. ^ "Flyers hire Dave Hakstol". ESPN. Associated Press. ^ Isaac, Dave (September 13, 2014). "Flyers Owner Ed Snider Says He's Cancer-Free". USA Today. Retrieved April 11, 2016. ^ Panaccio, Tim (April 11, 2016). "Flyers Founder, Owner Ed Snider Dies". NBC10.com. Retrieved April 11, 2016. ^ Hunter, Brian (April 11, 2016). "Flyers owner Snider dies". National Hockey League. Retrieved April 11, 2016. ^ a b "Flyers relieve Ron Hextall". Philadelphia Flyers. November 26, 2018. Retrieved November 26, 2018. ^ "Flyers Relieve Dave Hakstol of Head Coaching Duties". NHL.com. December 17, 2018. Retrieved December 17, 2018. ^ "Philadelphia Flyers take down Kate Smith statue outside arena". USA TODAY. Retrieved 2019-04-21. ^ a b c d e f g h i j k l m n o p q "Flyers History – Flyers Jersey History Gallery". FlyersHistory.net. Retrieved 2008-09-09. ^ "Special Features: THN.com's NHL Logo Rankings". The Hockey News. Retrieved 2009-12-10. ^ "Slideshow". National Hockey League. 2007-09-14. Retrieved 2009-12-10. ^ "Flyers' New Third Jersey". National Hockey League. Retrieved 2009-12-10. ^ "Flyers introduce Gritty, their new mascot". National Hockey League. September 24, 2018. Retrieved September 24, 2018. ^ "Philadelphia Flyers Roster". NHL.com. Retrieved April 6, 2019. ^ "Philadelphia Flyers Hockey Transactions". TSN.ca. Retrieved February 25, 2019. ^ "Angotti Leads Flyers". Arizona Republic. October 12, 1967. p. 108. Retrieved December 20, 2014 – via Newspapers.com. ^ "Penguins Pick Up Angotti in 3-Team Trade". Chicago Tribune. UPI. June 12, 1968. Retrieved December 19, 2014. ^ "Ed Van Impe Named Captain of Flyers". Pottstown Mercury. November 6, 1968. p. 19. Retrieved December 20, 2014 – via Newspapers.com. ^ a b "CLARKE NAMED CAPTAIN". The Herald. January 18, 1973. p. 14. Retrieved December 20, 2014 – via Newspapers.com. ^ "Clarke, Watson added to Flyers' coaching staff". Ottawa Journal. August 11, 1979. p. 24. Retrieved December 20, 2014 – via Newspapers.com. ^ "Bridgman Named Captain". The Gettysburg Times. October 12, 1979. p. 15. Retrieved December 20, 2014 – via Newspapers.com. ^ a b "FLYERS' BARBER FULFILLING ROLE". The New York Times. October 11, 1981. Retrieved December 20, 2014. ^ a b "RUSSIANS BEAT FLYERS IN FINALE". The New York Times. January 7, 1983. Retrieved December 20, 2014. ^ a b "SPORTS PEOPLE; Clarke Quits Playing". The New York Times. May 16, 1984. Retrieved May 15, 2011. ^ Shope, Dan (October 12, 1984). "Kerr's Late Goal Gives Flyers Tie". The Morning Call. Retrieved December 20, 2014. ^ a b Morganti, Al (December 16, 1989). "Sutter Takes The Ice As Captain of Flyers". The Philadelphia Inquirer. Retrieved December 20, 2014. ^ Bowen, Les (September 23, 1991). "Flyers Send Sutter, Baron To Blues". Philadelphia Daily News. Retrieved December 2, 2014. ^ Miles, Gary (October 3, 1991). "Tocchet Is Named Team Captain". The Philadelphia Inquirer. Retrieved December 20, 2014. ^ Fleischman, Bill (February 20, 1992). "Shaking Up The Flyers". Philadelphia Daily News. Retrieved December 2, 2014. ^ Bowen, Les (October 6, 1993). "Veteran Dineen Chosen As Flyers' Captain". Philadelphia Daily News. Retrieved December 20, 2014. ^ a b Bowen, Les (September 7, 1994). "It's Official: Lindros Gets His Stripes". Philadelphia Daily News. Retrieved November 26, 2014. ^ a b Panaccio, Tim (March 28, 2000). "Outspokenness Costs Lindros His Captain's 'C'". The Philadelphia Inquirer. Retrieved December 20, 2014. ^ a b Panaccio, Tim (October 24, 2001). "Desjardins yields helm as captain of Flyers". The Philadelphia Inquirer. Retrieved August 6, 2014. ^ "Keith Primeau Announces His Retirement". Philadelphia Flyers. September 14, 2006. Retrieved August 6, 2014. ^ "Derian Hatcher Named Team Captain". Philadelphia Flyers. January 29, 2006. Retrieved August 6, 2014. ^ "Peter Forsberg Named Flyers Captain". Philadelphia Flyers. September 14, 2006. Retrieved November 21, 2014. ^ "Flyers Acquire Ryan Parent, Scottie Upshall and Two Draft Picks for Peter Forsberg". Philadelphia Flyers. February 15, 2007. Retrieved November 21, 2014. ^ "Jason Smith Named Flyers Captain". Philadelphia Flyers. October 1, 2007. Retrieved December 20, 2014. ^ "Bulletin: Senators Sign Jason Smith To A Two-year Contract". Ottawa Senators. July 8, 2008. Retrieved November 22, 2014. ^ "Richards Named Flyers Captain". Philadelphia Flyers. September 17, 2008. Retrieved December 20, 2014. ^ "Richards Traded to LA for Simmonds, Schenn". Philadelphia Flyers. June 23, 2011. Retrieved June 28, 2011. ^ "Pronger Named Captain". Philadelphia Flyers. September 16, 2011. Retrieved December 20, 2014. ^ a b "Claude Giroux named Captain of the Flyers". Philadelphia Flyers. January 15, 2013. Retrieved January 15, 2013. ^ "Allen To Coach Philadelphia Club". Brandon Sun. June 7, 1966. p. 6. Retrieved December 20, 2014 – via Newspapers.com. ^ a b "PHILADELPHIA FLYERS NAME STASIUK COACH". Chicago Tribune. May 20, 1969. Retrieved December 8, 2014. ^ "Flyers Fire Coach Vic Stasiuk". Chicago Tribune. May 28, 1971. Retrieved December 8, 2014. ^ "NHL Flyers Name Shero New Coach". The Schenectady Gazette. Associated Press. June 3, 1971. Retrieved December 8, 2014. ^ "Flyers hire McCammon". The Free Lance–Star. Associated Press. July 7, 1978. Retrieved December 8, 2014. ^ a b "Flyers Ax Coach McCammon, Name Quinn as Replacement". Pittsburgh Post-Gazette. January 31, 1979. Retrieved December 8, 2014. ^ a b "Flyers unload Quinn, call back McCammon". Pittsburgh Post-Gazette. Associated Press. March 20, 1982. Retrieved December 8, 2014. ^ a b "SPORTS PEOPLE; 2 Coaches Out". The New York Times. April 25, 1984. Retrieved December 8, 2014. ^ Shope, Dan (May 25, 1984). "Flyers Name Mike Keenan As Head Coach". The Morning Call. Retrieved December 8, 2014. ^ Fleischman, Bill (May 12, 1988). "'Toughest Decision' Dumps Flyer Coach". Philadelphia Daily News. Retrieved December 8, 2014. ^ "SPORTS PEOPLE; 2 N.H.L. Coaches Hired". The New York Times. June 2, 1988. Retrieved December 8, 2014. ^ a b Miles, Gary (December 5, 1991). "Flyers Pull Plug on Holmgren Dineen Named As Successor". The Philadelphia Inquirer. Retrieved December 8, 2014. ^ a b Miles, Gary (May 25, 1993). "Flyers Pass Torch To Simpson". The Philadelphia Inquirer. Retrieved December 8, 2014. ^ Miles, Gary (May 21, 1994). "Players Claim Share of Blame in Flyers' Firing of Simpson". The Philadelphia Inquirer. Retrieved December 8, 2014. ^ Miles, Gary (June 24, 1994). "Murray Named Coach of Flyers". The Philadelphia Inquirer. Retrieved December 8, 2014. ^ Bowen, Les (June 14, 1997). "Where There's Choke There's Fire". Philadelphia Daily News. Retrieved December 8, 2014. ^ Moran, Edward (July 8, 1997). "Wayne Manner". Philadelphia Daily News. Retrieved December 8, 2014. ^ a b Panaccio, Tim (March 10, 1998). "All The Right Moves? All Sides Endorse Flyers' Changes". The Philadelphia Inquirer. Retrieved December 8, 2014. ^ a b Panaccio, Tim (June 9, 2000). "Flyers Give Ramsay Reward". The Philadelphia Inquirer. Retrieved December 8, 2014. ^ a b Panaccio, Tim (December 11, 2000). "Clarke Dumps Ramsay". The Philadelphia Inquirer. Retrieved December 8, 2014. ^ Panaccio, Tim (May 1, 2002). "Ax Falls on Barber". The Philadelphia Inquirer. Retrieved December 8, 2014. ^ Panaccio, Tim (May 15, 2002). "Flyers Try New Direction". The Philadelphia Inquirer. Retrieved December 8, 2014. ^ a b c d "Flyers GM Clarke resigns; coach Hitchcock fired". ESPN. October 24, 2006. Retrieved December 8, 2014. ^ a b "Flyers Name Peter Laviolette Head Coach". Philadelphia Flyers. December 4, 2009. Retrieved December 8, 2014. ^ a b "CRAIG BERUBE NAMED FLYERS HEAD COACH". Philadelphia Flyers. October 7, 2013. Retrieved October 7, 2013. ^ "Flyers' Berube Fired as Coach". 2015-04-17. Retrieved 2014-04-17. ^ "Dave Hakstol Named Head Coach". Philadelphia Flyers. May 18, 2015. Retrieved May 18, 2015. ^ a b "Flyers Relieve Dave Hakstol of Head Coaching Duties". Philadelphia Flyers. December 17, 2018. Retrieved December 17, 2018. ^ "Flyers name Alain Vigneault head coach". NHL.com. ^ "Bud Poile Joins Philadelphia". Santa Cruz Sentinel. May 31, 1966. p. 9. Retrieved December 20, 2014 – via Newspapers.com. ^ a b "Allen Named General Manager of Flyers as Successor to Poile". The New York Times. December 22, 1969. Retrieved May 15, 2011. ^ a b "SPORTS PEOPLE; Flyer Changes". The New York Times. May 28, 1983. Retrieved May 15, 2011. ^ "SPORTS PEOPLE: HOCKEY; Flyers Dismiss Clarke". The New York Times. April 17, 1990. Retrieved May 15, 2011. ^ Miles, Gary (June 7, 1990). "Gm Arrives, Gm Departs: Farwell Gets His Chance With Flyers". The Philadelphia Inquirer. Retrieved May 15, 2011. ^ a b Miles, Gary (June 16, 1994). "Clarke Waves Off Trading As A Goal". The Philadelphia Inquirer. Retrieved December 10, 2014. ^ a b "FLYERS PROMOTE PAUL HOLMGREN TO PRESIDENT; RON HEXTALL TO GENERAL MANAGER". Philadelphia Flyers. May 7, 2014. Retrieved May 7, 2014. ^ "Flyers Name Chuck Fletcher Executive Vice President & General Manager". Philadelphia Flyers. December 3, 2018. Retrieved December 3, 2018. ^ a b c d "Flyers Honor Roll" (PDF). 2015–16 Philadelphia Flyers Media Guide. Philadelphia Flyers. 2015. pp. 279–280. Retrieved April 29, 2018. ^ "Foster Hewitt Memorial Award Winners". Hockey Hall of Fame and Museum. 2018. Retrieved April 29, 2018. ^ "Elmer Ferguson Memorial Award Winners". Hockey Hall of Fame and Museum. 2018. Retrieved April 29, 2018. ^ a b "Flyers pay tribute to Barry Ashbee". The Calgary Herald. Associated Press. October 13, 1977. Retrieved October 30, 2013. ^ "Philadelphia Flyers Sweater Numbers". Hockey-Reference. Sports Reference LLC. Retrieved April 3, 2013. ^ Seravalli, Frank (November 11, 2010). "Pelle Lindbergh's spirit lives on, 25 years after fatal crash". Philadelphia Daily News. Retrieved October 2, 2014. ^ a b "Flyers retire Hall of Fame center Eric Lindros' No. 88". Fox Sports. Associated Press. January 18, 2018. ^ "Saleski Scores 2 Goals As Flyers Top Hawks". Milwaukee Sentinel. October 14, 1977. Retrieved October 30, 2013. ^ a b "Schultz to Join Flyers Hall of Fame". Philadelphia Flyers. October 13, 2009. Retrieved August 3, 2014. ^ "Eric Lindros, John LeClair and Eric Desjardins to be inducted into the Flyers Hall of Fame". Philadelphia Flyers. July 31, 2014. Retrieved August 3, 2014. ^ "Regular Season – Goalie – Goalie Career for Franchise – Career Wins – NHL.com – Stats". National Hockey League. Retrieved March 30, 2013.